The bidding war for 20th Century Fox will result in a shake-up of the film studio landscape, with both Disney and NBCU vying to become the box office leader. The traditional media and entertainment ecosystem, threatened by the rise of digital disruptors like Netflix, is undergoing significant change and upheaval. A large part of this upheaval is the race for content assets, with notable moves such as Comcast’s acquisition of NBC Universal, Disney’s purchases of Pixar, Marvel, and Lucasfilm, and the recently-approved AT&T / Time Warner deal. However, there are still moves to come – before the dust settled on the approval of AT&T / Time Warner, Comcast launched a $65B bid for 21st Century Fox’s film and TV production assets, topping Disney’s existing $52.4B offer and setting the table for a major showdown. A renewed deal between Disney and Fox was agreed upon, raising the price to $71.3B, with potential for further increases. The implications on the film industry are significant for either deal, with a Disney / Fox deal creating a clear leader at the box office and a Comcast / Fox tie-up forming a market leader with Disney and Time Warner within striking distance. For box office observers, seeing receipts come in may be as intriguing as the movies themselves. Watching the rise and fall of hyped features, the emergence of surprise blockbusters / flops and tracing the overall performance of movie studios to track the evolving media landscape and importance of content rights. In the past five years, there has been a shift in box office performance of the “Big 6” studios, with Disney retaking the pole position on the back of Marvel and Star Wars, with Warner Brothers slipping due to the relative flops of their DC Cinematic Universe. In the midst of this, Fox’s films have seen relatively stable performance, taking ~10-13% share outside of a strong year in 2014. (See Exhibit 1). 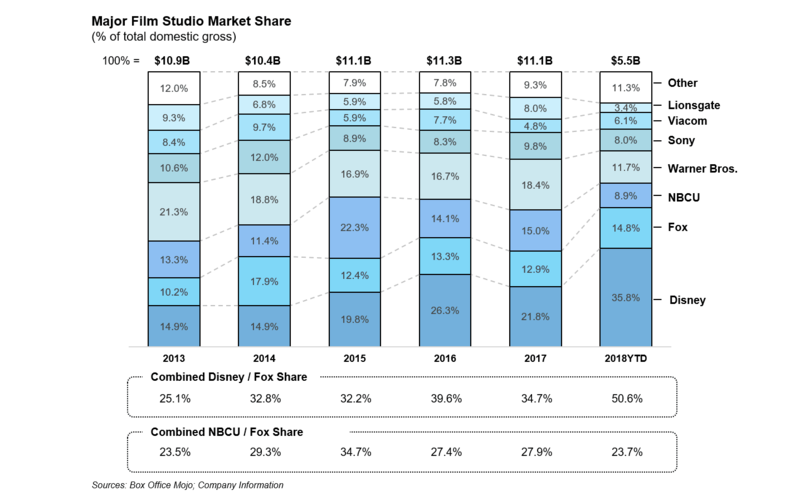 For both Disney and Comcast, the stability of Fox’s performance, along with its ability to generate strong returns from smaller content properties (e.g., The Greatest Showman, Hidden Figures), represents a strategic complement to the tentpole-driven nature of Disney’s (e.g., Marvel Cinematic Universe, Star Wars, Pixar) and NBCU’s (e.g., Fast & Furious, Jurassic World, Minions) properties. 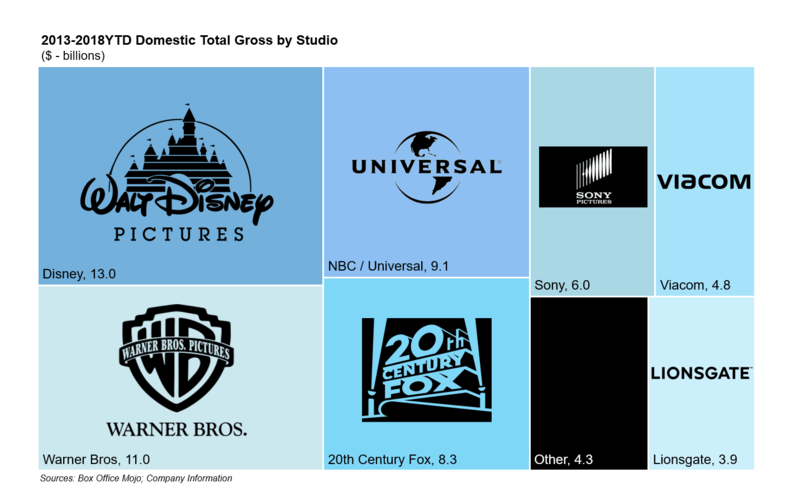 From an aggregate perspective, Disney’s resurgence has propelled total domestic gross over the previous five years to nearly $13B, well ahead of Time Warner’s ~$11B and NBCU’s ~$9B; Fox represents the 4th largest player at ~$8.3B (See Exhibit 2). Fox’s importance will likely increase in the future as two of the smaller studios, Paramount (Viacom) and Lionsgate, have underperformed and may be part of further industry consolidation. Movie studio performance is highly dependent on the content properties they own, and with investment in content by digital platforms (e.g., Netflix, Apple, Amazon) surging, locking up content rights to valuable franchises is essential. A perfect demonstration of the importance of content is Lionsgate. From 2011 to 2012, Lionsgate’s domestic gross increased more than 6X, from ~$184M to ~$1.2B, driven by two series: Twilight and the Hunger Games. However, since 2012, Lionsgate’s domestic gross dropped nearly 50% to ~$660M in 2016 after the end of the Hunger Games series – it recovered in 2017 off the performance of La La Land but has struggled without a marquee franchise in 2018. While the importance of major franchises is nothing new for the film industry, the recent reliance on existing IP and series reboots make the content rights that Fox holds even more valuable. Disney, under CEO Bob Iger, has pursued an aggressive content acquisition strategy that has paid off in spades. Iger started his buying spree in 2006 with the acquisition of Pixar for $7.4B, Marvel Entertainment in 2009 for $4B, and Lucasfilm in 2012 for $4.06B. These represent three of the largest movie franchises today, with the Marvel Cinematic Universe grossing over $5.2B domestically and $13.7B worldwide to date, with the 2019 release of Avengers 4 nearly guaranteed to rake in an additional $1.5B+. In total, these acquisitions have grossed $11.1B domestically and $27.4B worldwide, not inclusive of the massive merchandising, theme park and advertising value these franchises pull add. The addition of Fox’s key assets, including Avatar, X-Men, Planet of the Apes and Deadpool, could bring similar synergies throughout Disney’s portfolio, especially for its future direct-to-consumer OTT competitor to Netflix. 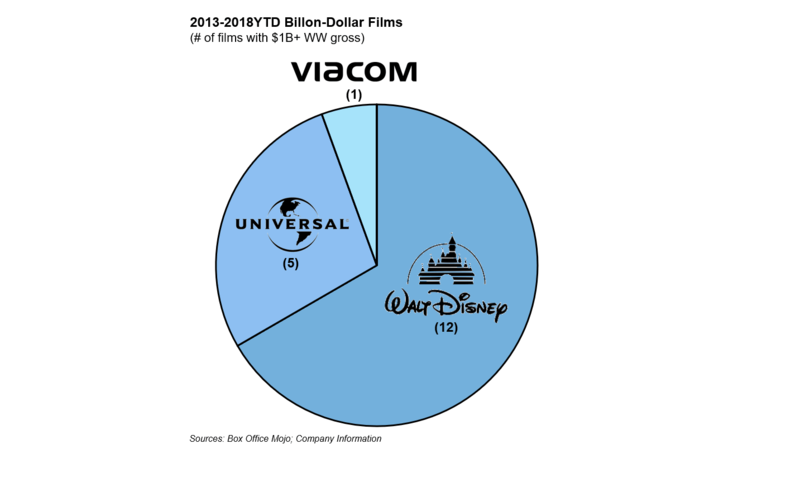 Similarly, Comcast / NBCU will be looking to these assets to balance out the box office power Disney alone commands, notwithstanding other players like Warner Bros. and Sony. One key market that NBCU has been locked out of is the superhero genre, and Fox’s assets would fix this significant gap, in addition to the upside associated with franchises like Avatar. One key differentiator between Fox and the other studios is their frequency of major blockbuster films ($1B+ gross worldwide). Fox’s films rarely reach $750M WW gross, let alone $1B, whereas Disney has produced 12 $1B+ films since 2013 and Universal has produced 5 (See Exhibit 3). However, it has consistently grossed $1.4B+ domestically with a portfolio of smaller releases that perform well relative to their budgets. The addition of Fox’s portfolio to Disney / NBCU can alleviate the risk associated with major flops (e.g., Solo, Batman vs. Superman) with the ability to drive growth through overperformance of lower-budget films. Additionally, Disney / NBCU may be able to leverage their marketing prowess and financial resources to promote Fox films better or use content assets in other mediums (e.g., TV). That’s not to say Fox doesn’t have the ability to hit grand slams too – the top worldwide grossing film of all time is Fox’s Avatar, which drew in over $2.7B globally in 2009/10. Fox holds the rights to Avatar’s sequels, which represent significant upside potential to whoever wins Fox’s assets in the end. The fight between Disney and Comcast for Fox’s assets is likely to continue, and further price increases may occur – at some level, the film assets represent a secondary consideration to Fox’s TV assets, which include 30% of Hulu, several US regional sports networks and ~40% of British broadcaster Sky. However, the eventual winner will be viewed as the leader at the box office with an extensive list of valuable content rights that will become all the more important as legacy media companies gear up to face an evolving ecosystem.